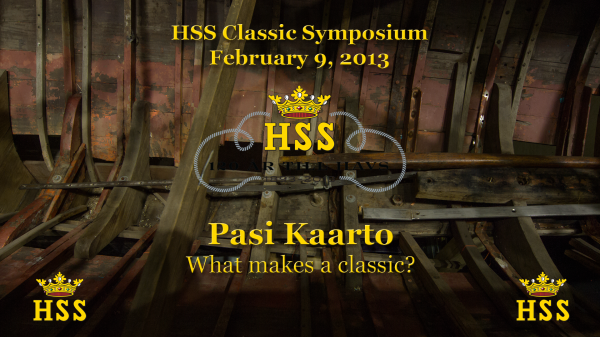 HSS Classic Symposium 2013 - Sail in Finland! The HSS (Helsingfors Segelsällskap) yacht club is one of the oldest yacht clubs in Finland. Today it is also the “Classic yacht” club of Finland with a very high percentage of beautiful classic yachts in the club fleet. 2013 is a special year for HSS as the club turns 120 years. 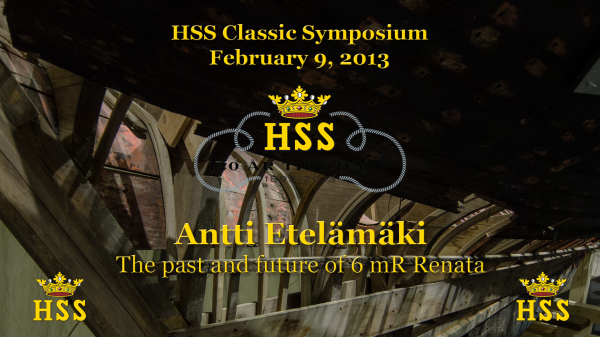 Thus the annual HSS Classic Symposium 2013 was particularly ambitious as it was part of the HSS 120 year celebration. The Symposium was held on February 9, 2013 at the Helsinki Convention Center in connection to the Helsinki International Boat Show. 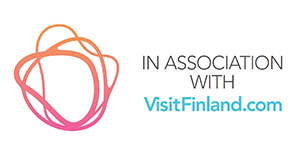 Sail in Finland was there of course, and now you can enjoy the first Sail in Finland video production: the full session recording of the Symposium. Click on the images for the videos and slides of the sessions! 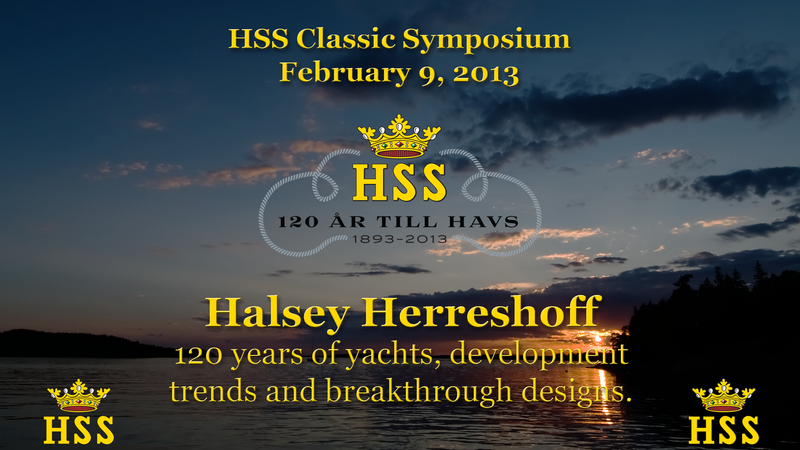 Halsey Herreshoff, the grandson of Nathanael Herreshoff and president of Herreshoff Designs, discusses Herreshoff boat designs over the years and makes some comments on recent developments in yacht design. Halsey also tells about his own sailing, including a trip to Finland. For the slides and video on Slideshare, click here and for the video on Youtube, click here. Tapio Saavalainen, himself an A class racer, discusses the birth and evolution of the Finnish A class sailboat. The A class was developed in on the request of the Finnish Sailing Association. It was a design class intended for both cruising and racing. The class design was completed in 1935 and the first boat sailed in 1936. Some 30+ A class boats were built over the years and a bit more than 10 still sail in Finland. For slides and video on Slideshare, click here and for the video only on Youtube, click here. Max Salminen and Fredrik Lööf won the Olympic gold medal in the Star class. The race was decided in a super exciting medal race. Max discusses how he came to race a star and how he and Fredrik prepared for the Olympics. Despite his very typically Finnish name Max is not Finnish but the connection to Finland is because the Olympic Gold was won with sails made in Finland by the sail maker WB Sails. For the video on Slideshare, click here and for the video on Youtube, click here. If you make up your mind to race in the Olympics at age 12 and get a sailing boat as consolation after your father passes away, then it will be exceedingly hard to avoid the fate of becoming a sailor and a racer. Jussi Gullichsen, the Grand Old man of Finnish sail racing, discusses these and many other interesting topics related to sailing 5.5’s. For the video and slides on Slideshare, click here and for the video only on Youtube, click here. Lars Ström, former design office manager at Nautor for more than 30 years, looks back at some of the design details of early Swans. Lars also helps you identify real Swans so as not to be fooled to buy a counterfeit one. For the slides and video on Slideshare, click here and for the video only on Youtube, click here. Timo Telkola from North Sails Finland discusses how racing sails have developed since the age of Dacron to 3Di sail making by molding. The presentation is given in Finnish. For the video and slides on Slideshare, click here and for the video only on Youtube, click here! Pasi Kaarto, himself sailing a beautifully restored 6 mR yacht, talks about different strategies for restoring old sailboats. At one end of the spectrum there is conservation and at the other end building a replica boat inspired by and old model. For the video and slides on Slideshare, click here and for the video only on Youtube, click here. Hannu Kähönen discusses how he experiences 8 mR sailing, both cruising as well as racing. For video and slides on Slideshare, click here and for video only on Youtube, click here! Club Renata is an association that intends to restore the very badly damaged 6mR yacht Renata. Renata is interesting because it belonged to Henrik Ramsay, a sailor and very influential politician in Finland. Renata won the 1928 Sandhamn regatta which in its time was a significant achievement as most of the best sailors of the time participated in the regatta. ← Your life jacket – Wear it!